Well, it comes as no surprise that the Beckhams have been invited to the Royal Wedding in April. David Beckham, all-star England football player spent valuable time with Prince William (also president of the British Football Association) while leading England's (unfruitful) bid for the 2018 World Cup. David and his wife Victoria, (former spice girl) a talented designer, are a couple of the most sought-after celebs to complement any such major world-event. We won't be getting any of the above invitations (unless you want to apply for a job at the wedding. See below for link). The 1,900 strong wedding party will consist of a mixture of A-list celebs, friends and family, members of the forces, and some charity workers. Of course, as is expected, some world leaders, our own Prime Minister, David Cameron, and foreign dignitaries will make their appearances. What a field day this will be for the paparazzi! If you were desperate for an invite, why not apply for a well-paying job as dish washer, waiter/waitress, or general assistant to help out at the wedding. 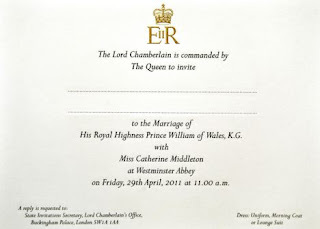 Go to http://www.royal.gov.uk for more information.